The desired drape of the fabric that you’re knitting will influence the gauge and the yarn and needle size you choose for your project. To decide on knitted drape, consider if you want the finished piece to be soft and flowing, very stiff, or somewhere in between. After you determine the drape, you can choose the right yarn and the right gauge for your project. Very dense, stiff: This density requires the smallest needles. For almost any purpose, this gauge is just too tight. If you’re trying to substitute yarns and the fabric that you make ends up too dense when knit at the gauge called for in the pattern, it isn’t the right yarn for the job. You need to find a thinner yarn for the project. Dense, but moveable: The piece won’t be floppy at all and will insist on keeping its own shape, rather than following the lines of the body. Covers, but drapes: You can see a bit of light through it when you hold it up. And when you put it on your hand, it moves to follow the shape of your hand, but it isn’t see-through. Drapes easily: You can definitely see light through the swatch and maybe even some skin. The fabric drapes easily. Drapes very easily: With larger needles, the stitches are very large. In this case, the knitted fabric is as much about the light and air between the stitches as it is about the yarn that surrounds these holes. Whatever type of garment you’re knitting, think a bit about what sort of drape and fabric suits it best when determining whether your gauge is right on target. Any yarn can be knit at a variety of gauges. 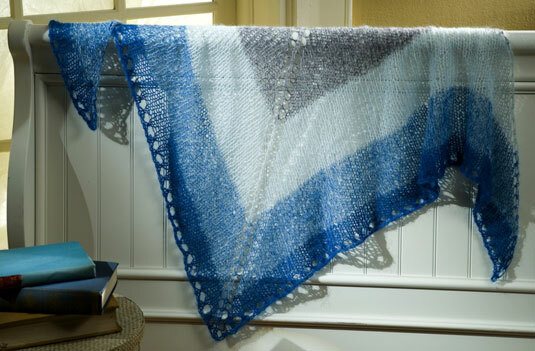 But getting gauge right also means deciding whether you like the fabric you’ve knit and whether you think that it’s right for the project that you want to make.